I generally like Second City revues. They don’t stay with me or anything, but they make me laugh and I enjoy the night, and the opportunity to have table service while going to a show always makes for a good time too. But this revue – Second City for Mayor, this one was different. I loved this one. It’s my favourite Second City revue of the ones I’ve seen. I was tying to figure out what would make it stand out so much from the previous ones, and I think it’s a big collection of little things. When I was talking to people after the show, I struck up a conversation with a woman who also really enjoyed this revue and through some round about discussions we decided that this was a far more “theatrical” production than other Second City shows we’ve seen. I don’t mean theatrical as in bigger or louder or anything like that. Just more, well, more kind of pulled together, more complete. A New Set for Second City Toronto: Second City has used the same type of set for about 800 million years. It’s always some form of a series of doors. Not particularily a surprise in comedy, it always makes me think of the Laugh-In joke wall, or for the Canadian folks of my generation – the You Can’t Do That On Television lockers (oh Alasdair, you’re so dreamy!). I mean, they weren’t used as joke walls, but they work for similar reasons. But, here’s the thing, I felt like it was kinda boring. And here is where Second City for Mayor first starts to win me over. The set is different! Gone are the doors, replaced with a sort of zig zag fire escape set against a cloth wall list from behind (known as a cyc), making it possible to create excellent silhouettes. It made it possible for a wonderfully visual opening for the show. Scene Transitions: This is actually related to the set… The cyc made it possible to have dynamic visual transitions between skits that I really loved. They added texture and flavour to the show that I haven’t felt in previous Second City shows. 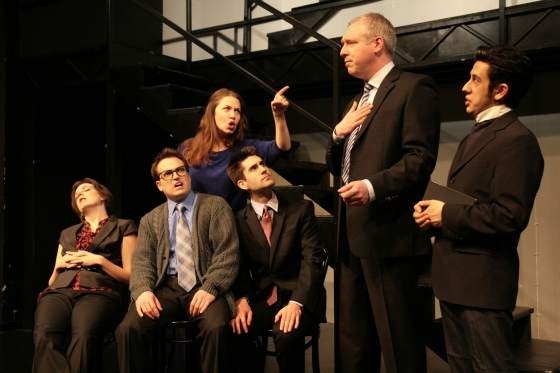 Interesting Content: So, there is always funny stuff in a Second City show. I mean, that’s the point, right? But this stuff had depth. The meatier content, which even included a few serious moments, provided a nice contrast to the funny. In fact, I think that for me, that juxtaposition made it funnier. It certainly made it more interesting. A Good Ending: I also really enjoyed the way this show wrapped up. It made this revue feel more complete than previous one. It was nice to have a full package. The woman sitting next at my table told me that she loved the show. She said her cheeks were hurting from grinning so much. Actually, I kinda had the same kind thing going on. What I’m trying to say here is, you should really check this show out. It’s great.